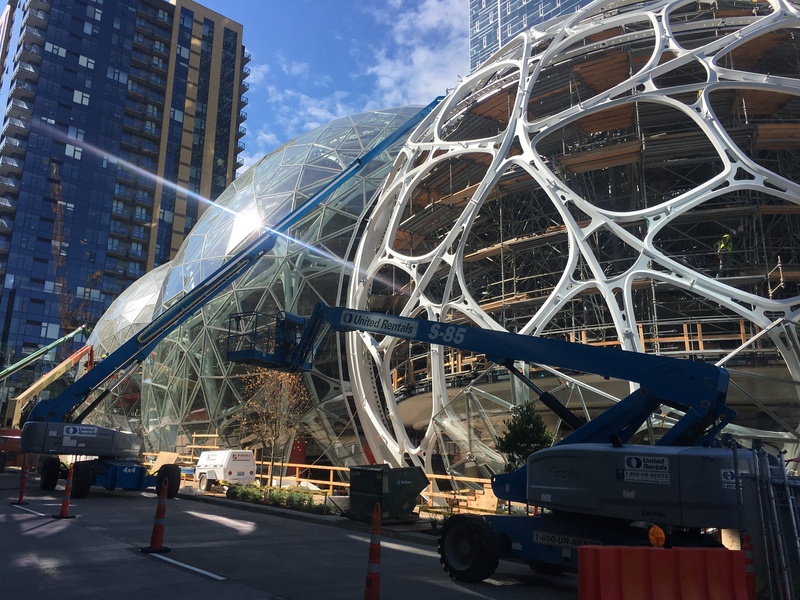 Amazon are building a forest: in the heart of downtown Seattle, beauty emerges, a convoluted scaffolding, sharp sunlight glinting off glass, anodised steel forming perfect spheres. A new building, an architecture of innovation. Three interlinked spheres that will form meeting spaces: this is architecture not as functional separation of space, nor as load-bearing trusses and beams, but rather architecture as aspiration, architecture as statement, and architecture as beauty. It is both playful and deadly serious. The biomes sit framed between two black towers: the dynamic tension between regularity and creativity, between straight edges and curved walls, between tradition and innovation. We can view buildings in two ways: the first is to see them as bricks and mortar, steel and glass, to see them as the distribution of force as gravity acts upon mass, to see them as structures that are built and maintained, to see them as weight and structure. The second is to view them as space: subdivisions based around intent. We can see beyond the physical structure to the spaces that it defines and delineates. If I look beyond the beauty of the biome itself, even standing as it is today, incomplete and bound by scaffolding, I see the intent, I can sense the space and the connections within it, since the smell of the damp earth and the feel of leaves brushing past, the filtered light through foliage, the clearings in the forest where we come together. Under this view, the sophistication of the architecture is merely in service of the space that it creates, and the space that it creates is merely in service of the conversations will happen within it. Architecture should sit at the service of people, not act as a boundary or prison. Architecture should not restrict us but rather set us free. There is a natural tempo to the way we walk, and rhythms the way we speak, there is beauty in motion. The role of a building is not to constrain this, but rather to flow around it. The building should be defined by the motion within it, not strangle or stifle it. It’s like a dancer: we can see the dancer as physical form, moving their body through muscle and sinew, we see them, through sheer physical strength, lift off the ground, and we hear the thump as they touch down. But this is simply one way to view the dance: the other is to see the shape that they dance through: the sweep of the arm delineates a space: the leap can be seen either as physical act, or as the graceful curve that is drawn. If we focus on the energy, if we focus on the sweat, we can fail to see the beauty of the whole thing. The dance can be defined as the story that is traced through the air, and in the same way a building can be defined as the energy and stories that flow through it. These buildings sit at aspiration and as statement: these are structures of confidence and power, and yet in some way, especially between the glass towers, the biomes are a statement of humility. Even in this nascent state, even as the hammer blows complete the framework, there is a sense that this building is defined by the plants that will live within it: the biome is in service of the life that holds. In this view, it is simply an eggshell, fragile and yet the only thing that sits between life and death. There is something about the design that reinforces this: indeed, this is the first building I’ve seen with such a tenuous connection to the laws of physics around it. Structure is clearly a product of computer aided design and 3D printing: there is a playfulness, not simply a regular geodesic structure, not a thing of replication and consistency, but rather one of irregularity and milled out shapes. There is an individuality in the shape of each panel, although a commonality in their unity, which speaks of the plants that they will one day hold and nurture. There is an almost organic feel to it. Aircraft engineers model the structure of materials to understand where forces flow: by doing so, they are able to cut holes through, to drill out, those areas which serve no purpose. It’s possible to save significant weight without compromising any structural integrity. There is that sense around the white steel structure here, although far more playful element to it. There is almost a sense that it is grown more than manufactured. One can almost see the forces running through the steel, and yet one’s eye is drawn to the windows in between. You could not conceivably come up with a more opposing view of architecture than the regular lines and 90° angles of the buildings that surround: this is an opposition not simply accidental, but quite deliberate. And that is the source of its beauty and wonder. There is innovation within those buildings to: I was lucky enough to be given a tour of the wonderful spaces that surround, but these are spaces that operate within a convention. These are a redefinition of a known space, whilst the biomes of the creation of a new one. A space more fragile and connected than the others, because the strength of this space will come not from the materials through which it is built, but through the dynamic tension between materials, people, and the growth of the ecosystem within. Its strength will not come through regularity and conformity, but rather through organic growth and flow of conversations, the movement of sunlight, the closed system of hydration, and even the changes in atmosphere as photosynthesis takes place. This is a system that may be monitored, but cannot in the truest sense be controlled. For me that will be the triumph of the space: that it will create spaces, but it will not seek to control them. But the organic and ever-changing nature of the story is embedded within the architecture itself. This is not simply a space where meetings will take place: it is in many ways both challenge and an incitement to those conversations. It’s easy to dismiss the importance of architecture: on the one step we admire small numbers of standout buildings whilst entirely ignoring the majority of structures that we inhabit every day. It’s easy to create a new structure that captures attention to size and scale, but these biomes are not spectacularly large, nor spectacularly positions to command an outstanding vista or view. They will not form part of a dramatic skyline, but rather are deeply rooted to the ground, indeed looking partly buried within it. In that sense they are there to serve not to dominate. Do we have better conversations in nicer spaces? It’s hard to say: creativity and innovation can be nurtured or provoked. We may have our best conversations when everything is against us, when we are enclosed and restricted. But there is something permissive about a creative space, something permissive about a beautiful space, and I think that is the intention here. Not to create a space that dominates, not to create a space that intimidates, but to gracefully sketch out a space drawn with lines of elegant steel and through the fronds and branches, to sketch a space for stories to be told. And if that’s the case, it will be a triumph. 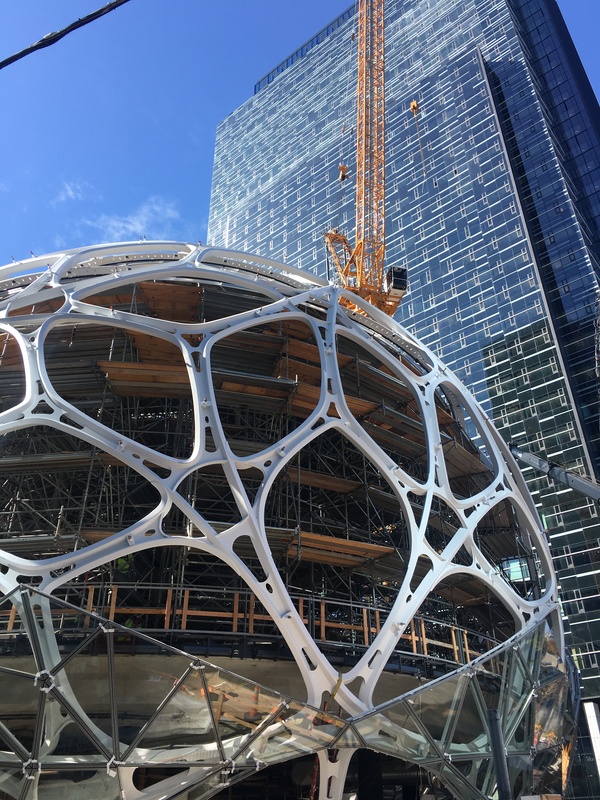 This entry was posted in Achievement, Adaptability and tagged amazon, Architecture, Beauty, Biome, Community, Conversation, Innovation, Plants, Seattle. Bookmark the permalink.